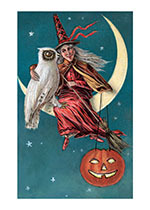 A witch, a Jack-O-Lantern a moon and an owlall the symbols of Halloween pictured together. A witch, a Jack-O-Lantern a moon and an owlall the symbols of Halloween pictured together. The white owl is particularly large and handsome.